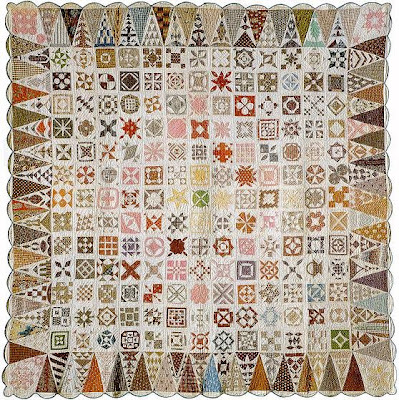 We're talking about Dear Jane®, that is... the civil war-era quilt, made by Jane A. Blakely Stickle in 1863. Jane's quilt had received scant attention until it was 'discovered' 18 years ago by Brenda Papadakis. 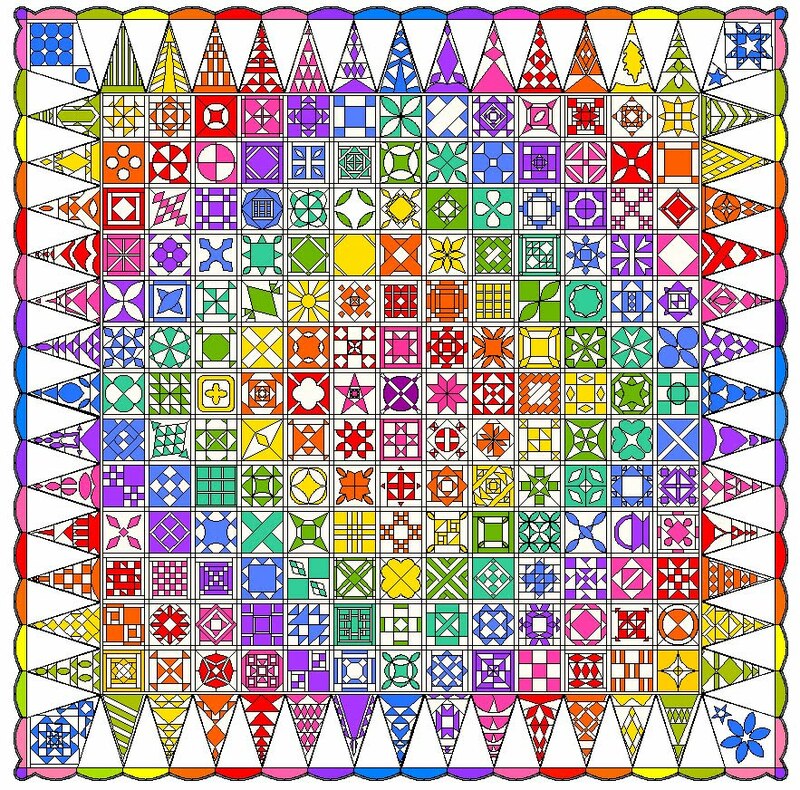 Brenda spent over 5 years documenting and drafting all 225 blocks (169 squares, 52 triangles, and 4 corners - do the math!) and writing a book about Jane and her quilt. Since then, the book has sold over 100,000 copies and inspired legions of "Janiacs" who have taken the plunge. Let's put it this way: if they held an Olympics for quilting, Dear Jane® would be the main event. 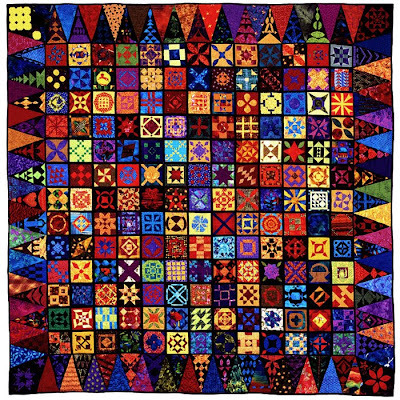 "The Quilt", as it is sometimes called, has inspired such humorous descriptions as "Dear Jane's a Pain", "No Pain - No Jane", "My Insanity", and - somewhat tersely - "That Quilt" (one can imagine that an expletive has been deleted!) On the other hand, the quilt is truly fascinating: each little 4.5" block is a work of art, and the finished quilts we're showing today are breathtaking. If we were handing out the medals, they'd all be gold! 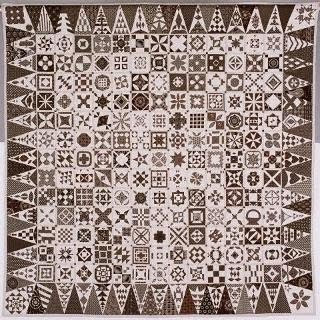 The photo is by Ken Burris, Shelburne, Vermont, and is courtesy of the Bennington Museum and the Vermont Quilt Festival. 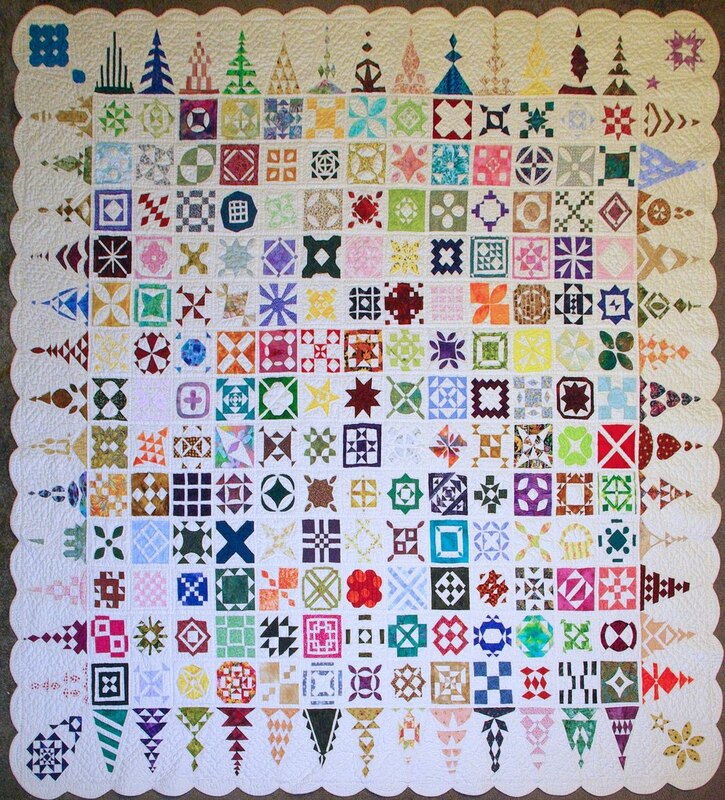 This is the quilt documented by Brenda Papadakis in her bestselling book, entitled Dear Jane®". Some of the prettiest 'Dear Jane' quilts we’ve seen come from France, and this beautiful Baby Jane is an example. 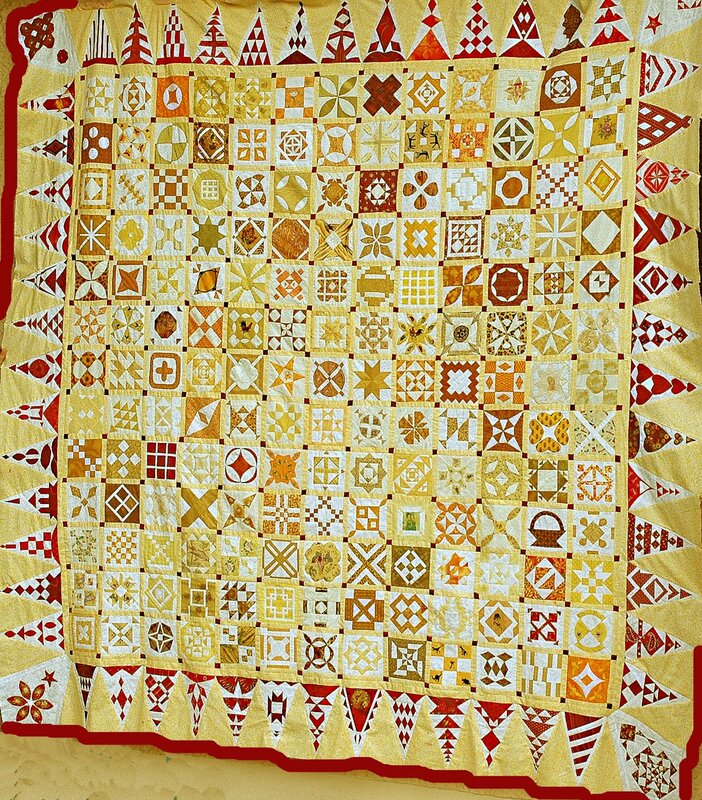 (In Dear Jane® lingo, all quilts inspired by the Jane A. Stickle quilt are considered to be Baby Janes.) 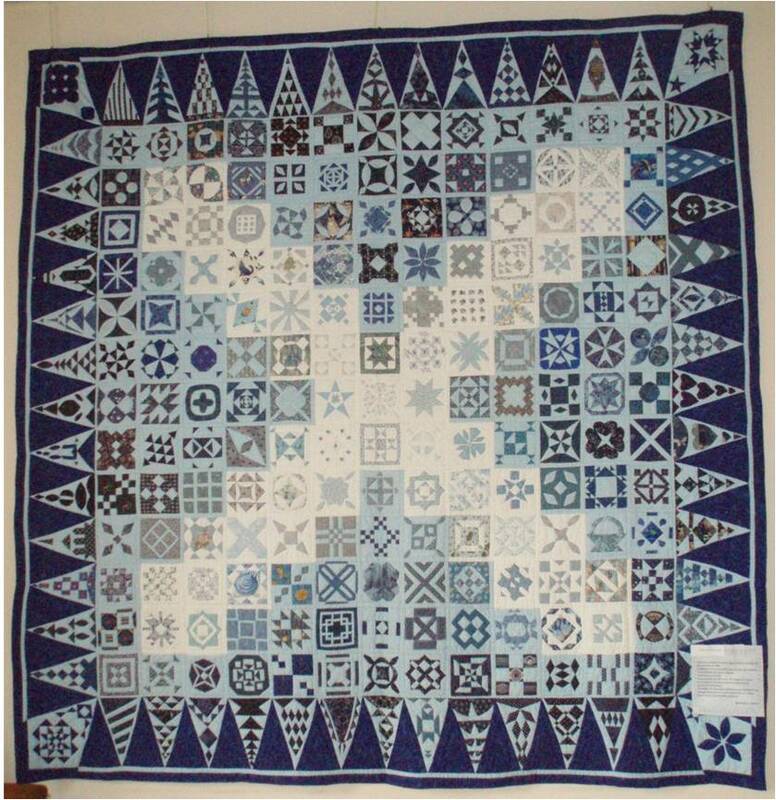 The blocks that create the white “X” design have pieces in the palest blues and grays, providing a focal point and a lovely contrast for the rest of the quilt. The surrounding blocks all have a sky blue background and are rendered in shades of blue, gray, and contrasting prints. 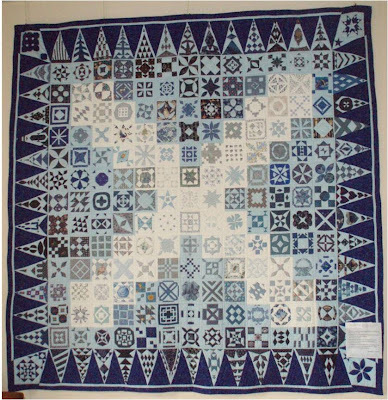 The border has a dark blue background, which highlights the triangular shapes of the border blocks and ties in the darker pieces in the quilt. 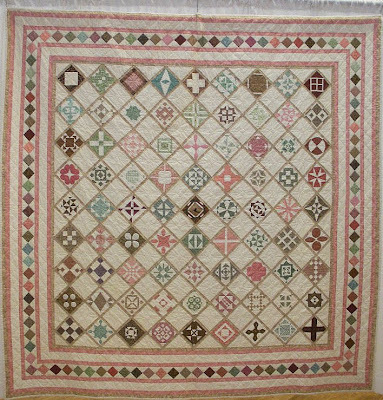 We’re pleased to be able to show this quilt, with the courtesy of Bernadette Camus and Délégation France Patchwork 77 (Marne et Seine). 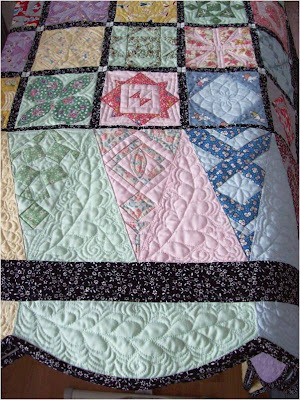 To read about this quilting guild, visit France Patchwork 77 and see their Baby Jane page, here. 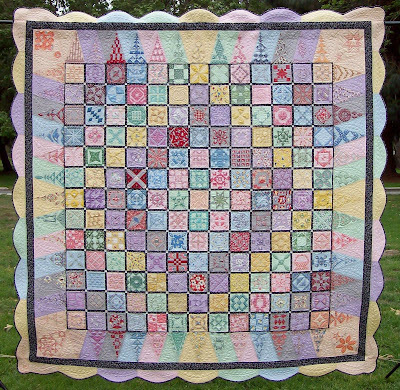 This fabulous quilt by Cindy Garcia was made with 222 different 1930’s reproduction fabrics, some of which Cindy and her daughter collected together. The black sashing is done in a reproduction print, and the entire quilt is surrounded by a scalloped edge which emphasizes the triangle shapes of the border blocks. 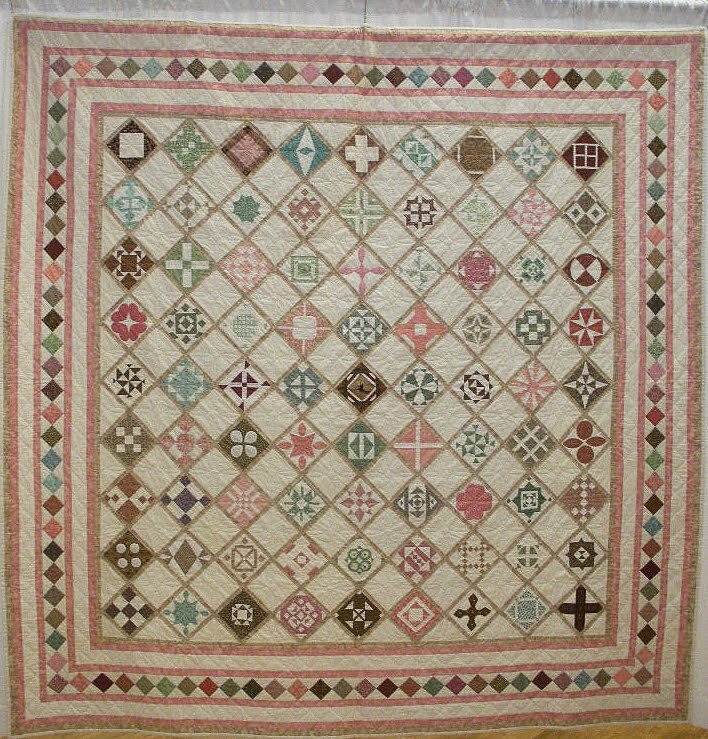 The four corners of the quilt are done in lavender and apricot, creating a secondary pattern reminiscent of flowers in bloom. Cindy Garcia began the quilt on March 31, 2006, and finished it in record time, exactly one year later. The quilt has a total of 5,584 pieces. She says: “It was a daunting task and sometimes difficult when my hands would ache, so I titled it, 'No Pain, no Jane'.” The quilt was awarded a first place ribbon at the 2008 Indiana Heritage Quilt Show in Bloomington, Indiana, a first place at the 2008 National Quilt Association Show in Columbus, Ohio, and 3 ribbons at the 2008 Wisconsin State Fair, including first place in the domestic machine quilting category. For the full story of her Dear Jane quilt, click here; for more information about Cindy Garcia, visit her site at Kwilty As Charged. (note added 12-28-2010: this website is now 'parked' and is no longer active. 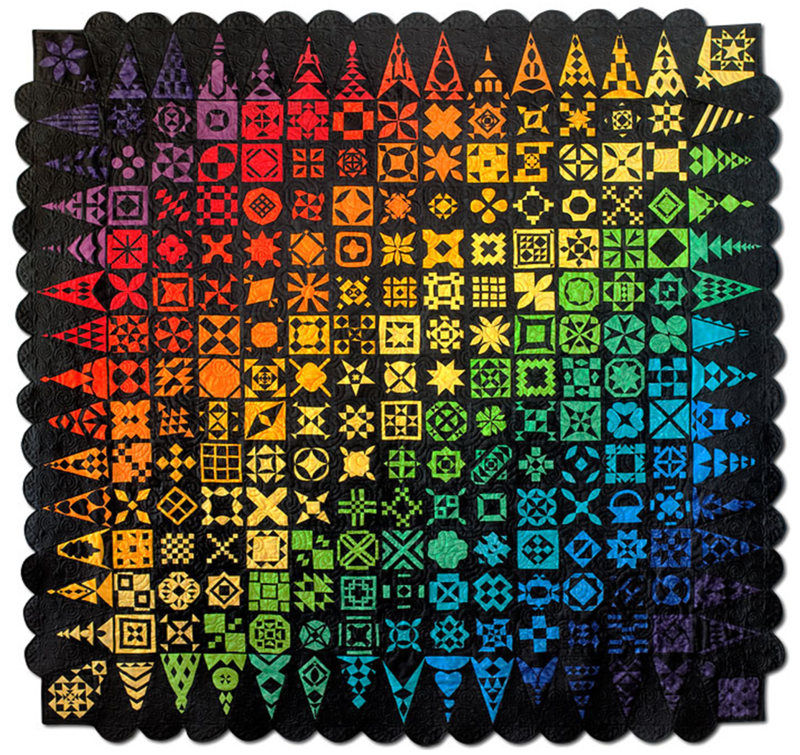 Cynthia's new site is Cynthia Garcia Quilts). This Baby Jane is simply spectacular with its sunny colors, which reflect the name: "In the Heat of the Day." Marie-Suzanne Charlot decided to work with reds and yellows, "to keep warm in my head!" The quilt is made in cottons and silks, and Marie-Suzanne introduced prints, stripes and florals in order to enhance and magnify the design of each block. We love the distinctive fabrics and charming prints, as shown below. Karen Goad hand-pieced and hand-quilted this beautiful heirloom, which is made of 4,928 pieces of fabric. No two blocks have the same fabric! 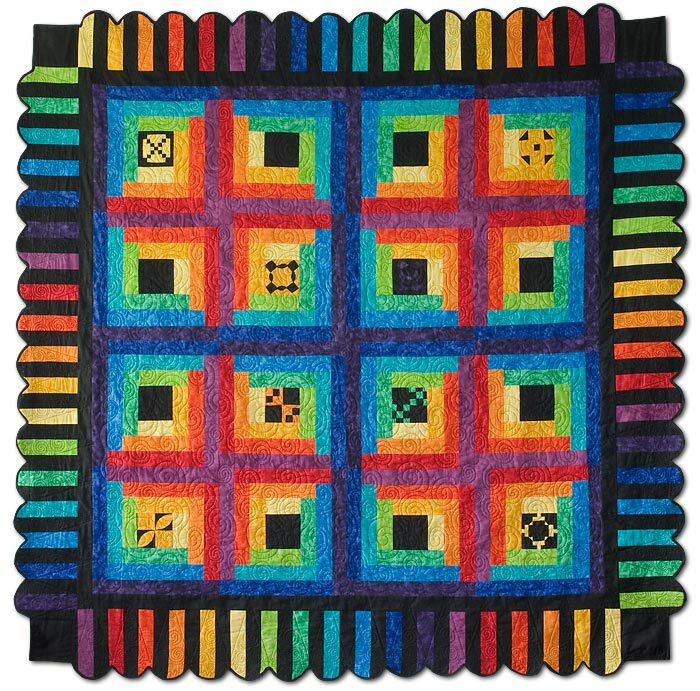 All the blocks are made from scraps, in all colors of the rainbow, giving the quilt a gem-like quality. Karen Goad estimates that the quilt took 645 hours and 30 minutes of work, spread over 4 years and 9 months. She says that she did not aim for perfection (but you could've fooled us; see the immaculate hand quilting of the corners, below.) For the full story, visit Karen’s Quilting. Not content with one round of “Insanity”, Karen Goad is in the midst of a second brilliant Dear Jane quilt which she calls “Insanity Revisited”. The first five rows, which are already stunning, are shown above. The ruby red batik is called “Princess Mariah”, and the light color batik is called “buttercream”. Just like the first quilt, this one is all hand pieced. Karen explains that the second quilt is about 50 hours faster in terms of actual labor, but is slower in terms of months. To see the current progress of the quilt, with 9 rows completed, click here. These two-color baby Jane quilts are both beautiful and elegant; they were made by Tutu Haynes-Smart, who lives in South Africa. The first quilt was done in indigo blues, using over 100 different Da Gama indigo prints, while the second quilt was done in chocolate browns. Remarkably, Tutu was somewhat of a neophyte when she began these quilts... now, she designs her own patterns using EQ. Both of these quilts were made with indigo cotton fabrics from South Africa. The fabrics are imported to the U.S. by Marula Imports. These richly dyed cottons, which are used in African attire, are known as shweshwe. We love the fabrics, with their deep colors and intricate all-over prints: a few of our favorite 'blues' are shown below. The product line can be found here. This exquisite quilt was designed, pieced and hand-quilted by Maryellen Sand Bodell. The quilt won a blue ribbon at the 2009 Santa Monica Quilt Show, "Explorations". Maryellen was inspired to make her rendition of 'Dear Jane' after reading Brenda Papadakis’ book: “I was intrigued by the story about Jane during that period of time when her world must have been torn with strife. 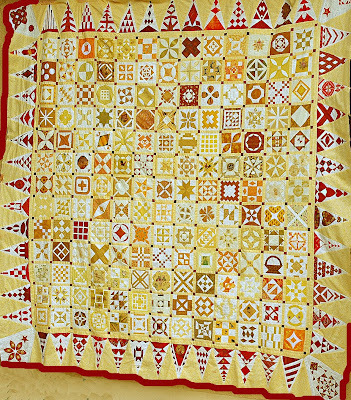 As with so many quilters there is a tranquility in taking needle in hand and creating images of beauty to be treasured for years to come.” Regarding her design, Maryellen explains that her mission was to maintain the colors and textures of the Civil War era: "My choice of blocks was difficult since all of her ideas were lovely so I placed each finished block on a spare bed and continued to consider versatility and balance of color and texture." The squares were placed on point and alternated with plain quilted blocks, and with half-inch neutral sashing, to allow the viewer a chance to fully appreciate each block and to create movement. 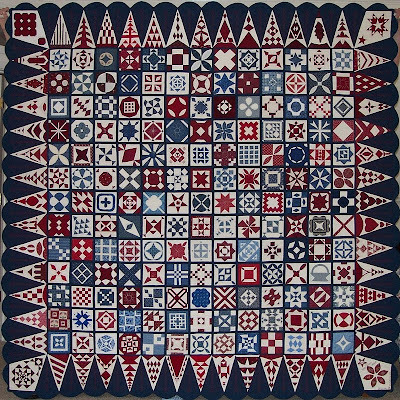 The border design beautifully complements the body of the quilt, with the continuation of squares on point and multiple borders. 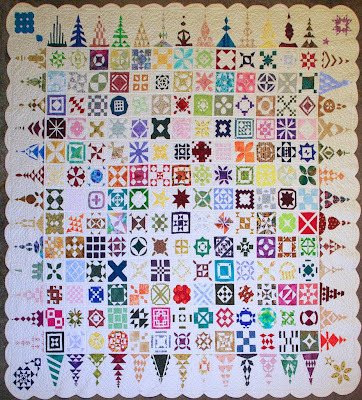 Please click on the quilt image above to bring up a larger image. To view this award-winning quilt at Santa Monica Quilt Guild site, click here. We're smitten by "That Quilt", by Anina of Twiddletails fame. In the blog, she details the progress on her Dear Jane quilt, which began two years ago. The first four rows are shown above; you can see every one of her 192 blocks (so far), by visiting That Quilt. The quilt is 85% done and it promises to be a stunner. 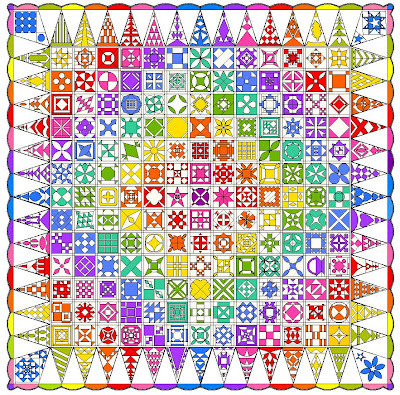 Anina has also designed a gorgeous "Rainbow Jane" in bright colors on a white background (below, see the first three rows- which have been joined - and the EQ diagram). 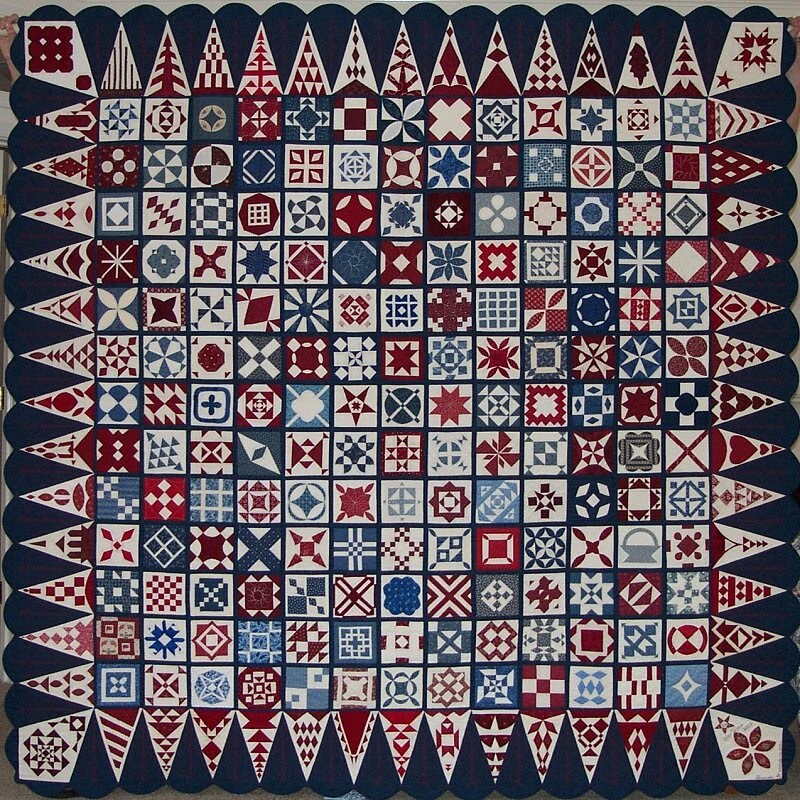 This patriotic quilt was presented to President and Mrs. Bush for their leadership and guidance following the tragic events of September 11, 2001; it is also known as "The President's Quilt" or "The GWB Quilt". 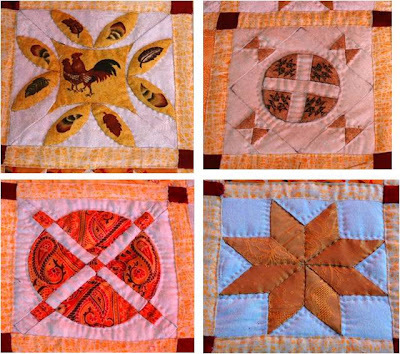 The blocks were made by Dear Jane Friends world-wide, pieced by the Maple Leaf Quilt Guild, Goshen Indiana, and quilted by Cathy Franks of Indianapolis. The quilt contains all 225 patterns. The square blocks are blue-and-white and red-and-white. The triangles are all red on white, as are the corner kites, all set against navy blue sashing, solid triangles and scallops. There is a color photo in the Dear Jane® Manual and in the "Quilt Gallery" on the DJ-CD (more about the CD, below). For a larger view, click on the quilt above; for additional photos, click here. The magnificent quilt called "In Our Time", above, was co-created by Judy Doenias and Diane Rode Schneck. 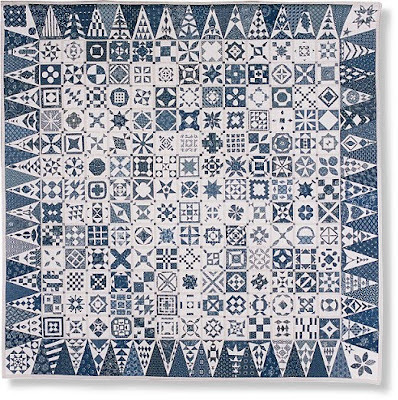 The quilt is also featured in the Dear Jane® Quilt Design Software, available here. Over the last ten years, Judy and Diane have taught several hundred students in The City Quilter's Dear Jane classroom. As a result, a rather substantial DJ community has developed in New York. And here is another important fact: the affectionate term, “Janiacs”, was coined by Diane Rode Shneck, and subsequently adopted by DJ'ers worldwide! 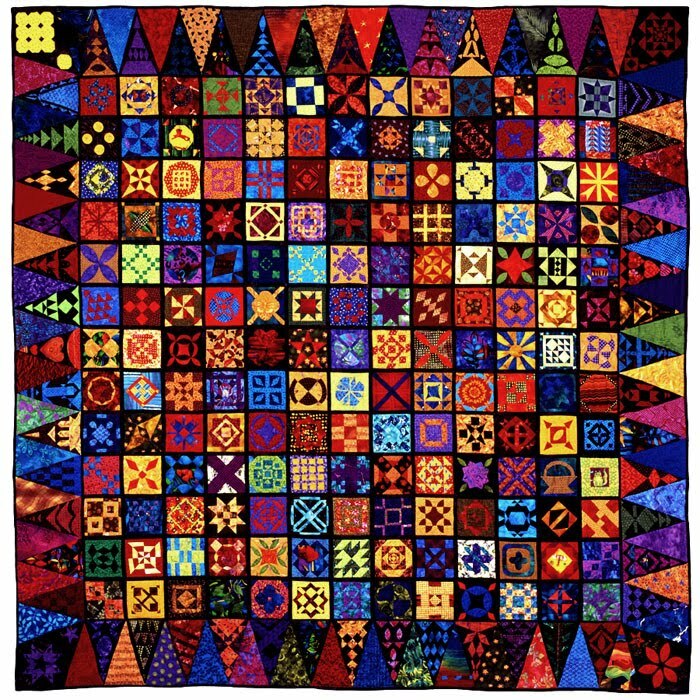 And speaking of New York City: the phenomenal quilt known as "Broadway Jane", above, was created by the Empire Quilters guild for their 2009 Show Raffle. The winning ticket was selected by Brenda Papadakis (of Dear Jane® fame). What a raffle that must have been! 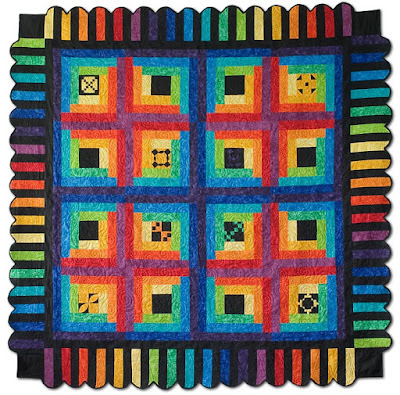 The patterns for the blocks and triangles come from Jane Stickle's original quilt, but the vivid rainbow of colors were chosen by the Empire Quilters' design committee, with the following dedication: "With this quilt we honor the traditions of quilters everywhere, and the colorful, complex, yet cohesive City of New York." We can't resist showing the back of the quilt as well, with its beautiful rainbow colors (below). More Baby Janes: For additional inspirational stories and/or images, see the following web pages: Marcie Thompson, Lyn Brown, Jean Amundsen, Crispy Quilts, and Redwork in Germany. Credits: Dear Jane® is the registered trademark of Brenda Papadakis and is used with permission. A sincere thanks to Brenda for her hard work and dedication, and for inspiring us all. Quilt images are shown with the kind permission of the artists. All I can say is WOW!!! Thank you so much for sharing all these gorgeous Baby Janes on this site. It is so inspirational, I'm renewed and remotivated all over again, to keep going! Wow! Lotsa BJs. Thanks for visiting my blog and I must say, after visiting yours, all I can say is "Wow!" with all the lovely quilts. Just came across your website, SO WOW !!!!!! I also am a quilter and love all you pictures and posts on the quilts , please keep up the great work looking to your future posts and please add me to your list! Thanks for this Dear jane post. I can only dream about it ..... Maybe one day!!! Thank you for this Dear Jane post.